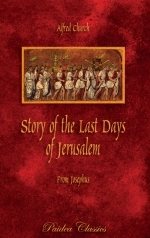 The "Story of the Last Days of Jerusalem" is an adaptation of Josephus’ dramatic first-hand account of the fall of Jerusalem in A.D. 70 in his famous historical work, "The Jewish Wars." It captures in detail one of the greatest tragedies of all time, often overlooked in more contemporary histories. Some of the scenes are particularly graphic and are not suitable for younger or more sensitive readers. But this text is an invaluable addition for the more mature student who is interested in studying the final history of Ancient Israel, yet does not have the time to read Josephus’ original but very lengthy work. Includes a scriptural quotation at the beginning of each chapter prophecying the events taking place. A simplified retelling of the great historian Flavius Josephus’ epic narratives, “The Antiquities of the Jews” and “The Jewish Wars.” The history of Israel from the time of Abraham until the fall of Jerusalem in A.D. 70, following the Septuagint chronology. This work is an invaluable supplement to the study of Old Testament history.